Paper Makeup Stamps: July Sneaks Day 3 - Another Day of Diem! Today marks day 3 of our sneak peeks for the upcoming July release! Our resident illustrator, Diem Pascarella has been hard at work this past month! Not only did she create 2 new animals for the Retro Cutie Critters but she also drew up 2 new fun fairies and a separate fun matching image! First, we've been asked for a fairy that would be easier to color with a little more ethnicity. I also wanted to give a big shout out to our Guest Designer for the month, Jane Wetsel! I had fully intended to do a special blog post to announce Jane for the month, but with the computer craziness and then my quick jot out of town to be with my grandmother, well, i kinda forgot about that post! 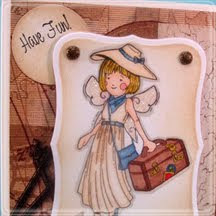 Jane is our very first guest designer and she exudes with talent! You will get to see more from Jane this month including our blog hop on the 7th which leads into the release and also later throughout the month. Please welcome Jane to our team today by checking out her blog! And next we have the Lisa Fairy! Lisa was named after our very own senior Paper Makeup Artist, Lisa Kind. Lisa is a traveler and is always off to her cabin or some fun thing with her hubby, though she is always taking her PMS with her! God love her for it! We have been so fortunate to have Lisa on our team and I'm so happy to have this fairy to honor her! 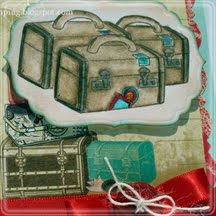 Now to go along with this fun cutie, is a separate image called Lisa's Luggage. 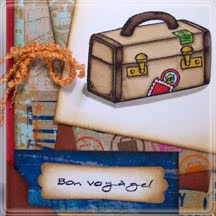 It will be sold seperately but does come with an additional sentiment, Bon Voyage! One last thing... you may have noticed the "Have Fun" popping up on a lot of the Paper Makeup Artists creations! That is the freebie sentiment for the month that will come with every order while supplied last! Thats all of our peeks for today! Leave a comment here for your chance to win both fairies and the Lisa's Luggage set! I am loving all of the sneak peeks so far. Off to check out everyone's blogs!! very cute looks like we are off to travel with lisa and our luggage. Loving the luggage!! What a great sneak peak!! Lisa with her luggage is perfect for vacation getaways. Beautiful releases! Awww, the fairies are just so sweet, and how yummy is that luggage? Adorable fairies! 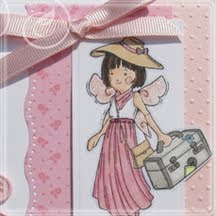 And I love the luggage cards. Such fun! These are all wonderful... I love Maya, she's adorable! Thanks so much for sharing & the chance to win!!! These are super cute! I love the luggage! Awww, what adorable fairies. And how cool that you named it after a follower's daughter!! Such a cute set. And I love both of the new fairies. 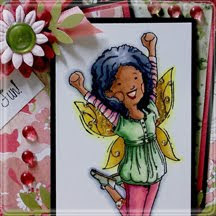 I love that you've added a bit of ethnicity to the fairy line too of stamps! :) And congrats to Jane for being this months guest designer. 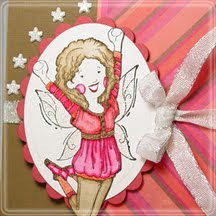 these look fantastic- as a grandma of girls fairies and things with wings are always in demand. Super cute! I love the luggage. 3 cheers for Lisa! I whole-heartedly agree... Lisa just rocks! Just darling!! These faries are too cute... love the luggage!